Stalin's Missed Chance is a book published in 2000 by Russian military historian Mikhail Meltyukhov, regarding Viktor Suvorov's controversial theories regarding Soviet war plans during 1939–1941. Meltyukhov, author of several other books and articles on Soviet military history, rejects claims that the Axis invasion of the Soviet Union was a preemptive strike. However, contrary to scholars such as David Glantz, John D. Erickson, and Richard Overy, Meltyukhov concurs with Suvorov's claim that Stalin and the Soviet military leadership had planned an offensive against Nazi Germany in 1941. Meltyukhov suggests that while both Soviet and German leaders were preparing covertly to attack each other, neither believed that the other side would strike first. Unlike many of Suvorov's books, such as Icebreaker (1987), Meltyukhov's book is based on material recovered from the archives of the Soviet Union, some of which remained classified for more than 50 years. According to Meltyukhov, Russia had lost its position as a Great Power during the Great War, the Revolution and the subsequent breakup of its Empire. The Soviet leadership had the option either to accept the regional status of the USSR or to become a Great Power once again. Having decided for the latter, the Soviet leadership used Communist ideology (the Comintern, the idea of world revolution etc.) to strengthen its position. The key objective was to exclude a possible alliance of Capitalist countries. Although diplomatic relationships had been established with the capitalist countries, the USSR was not accepted as an equal partner. That changed, however, in the course of the political crisis of 1939, when two military and political blocs were formed: Anglo-French and German-Italian, both of which were interested in an agreement with the USSR. Moscow then had the opportunity to choose with whom and under what conditions to negotiate. The basic aim was to retain neutrality, and after the weakening of both belligerent sides, to emerge as the decisive factor in ensuring victory for one side. Thus, "the USSR succeeded in staying out of the European war, after obtaining in this case a significant free hand in Eastern Europe, wider space to maneuver in its own interests between the belligerent sides." During the years 1939 and 1940, the USSR annexed several Eastern European countries and territories. The Kremlin viewed Germany as a force capable of weakening the positions of the United Kingdom and shaking the capitalist order. And "then at the suitable moment the Red Army could have destroyed Germany and would have freed Europe both from fascism and from 'rotten capitalism.'" As for Soviet-German relationship during 1940, Meltyukhov points out that although both sides had the common goal of weakening Britain and negotiations were held in November 1940, an actual military alliance was never realised, for Soviets would have had to leave the whole continent to the German-Italian sphere of influence, i.e., relegating the Soviets to a second-rate role in the world matters. From that time on, it became clear that Germany was the main obstacle for Soviet penetration into Europe, and the relationship between the two entered a new phase. Both sides began preparing for the conflict. The USSR took steps to normalize relations with the Western governments (including French leaders). These negotiations intensified as rumours spread about a possible Soviet-German military conflict. In June 1941, the Soviets proposed negotiations with Germany, which could have deceived the Germans and provided justification for an assault should the talks break down. From the beginning of 1941, measures were taken for increased combat readiness in the Western boundary districts, a large part of which was to be completed by July 1. The Soviet economy approached war footing and the country had prepared for troop mobilization since 1939. According to Meltyukhov, the material resources and system of mobilization ensured the development of the army. He claims the Red Army considerably exceeded the German army in the quantity of armaments and combat materials (Meltyukhov 2000:497). By saying that, he rejects David Glantz' work, which portrays the Soviet army as seriously unprepared for war. As Meltyukhov asserts with his study, the General Staff of the Red Army had already begun developing a plan for an assault on Germany in October 1939. This process intensified in March 1940, and at least four different versions of the plan were developed throughout 1940 and 1941. 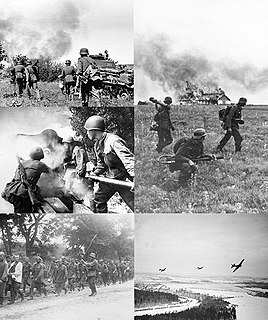 The concentration of troops was disguised as maneuvers; in May/June 1941 the preparation for a Soviet invasion of Germany reached the final stage, as the full-scale concentration of troops began. It is worth mentioning that the draft plan from March 11, 1941 demanded to "start the offensive [on] 12.6. ", which in Meltyukhov's opinion should refute Gorodetsky's  affirmation that the draft assumed defensive strategy. As it is known, the precise date of the outbreak of war is determined by the side which plans to strike first. Thus, the author thinks that the idea that the Red Army must strike first (clearly formulated in Zhukov's plan from May 15, 1941) was in a concealed form already present in all the previous drafts. As for the usual suggestions that the Red Army was preparing a counteroffensive, a possible Wehrmacht invasion is suggested in plans cited by Meltyukhov, but with obvious lack of depth: the estimation of the enemy's intentions, with exception of the possible direction of the main attack, did not undergo substantial changes. Furthermore, Meltyukhov claims those plans did not proceed from factual data and two possible Wehrmacht assault directions (Southern version, through Ukraine and Northern version, through Lithuania and Latvia, the latter being abandoned later) were taken into consideration, while an assault on Belarus was excluded without any reason. Thus, one might wonder if this was merely guess-work. Aleksandr Vasilevsky has recalled himself that there was no straight answer to the probability of a German invasion, nor was a possible timing discussed. This fact and the absence of a connection between a possible strike by the enemy and the actions of the Red Army makes the suggestion of a 'counter-strike strategy' very implausible to Meltyukhov. Military actions would have begun with the surprise blow by the Soviet Air Force on the airfields of Eastern Prussia, Poland and Romania. The overall Soviet superiority in aviation would have made it possible to subject German airfields in a 250 km-deep border zone to continuous airstrikes, which would have led to a significant weakening of the enemy and would have facilitated Red Army ground forces operations. The ground forces were supposed to have two major strike directions: one striking towards Eastern Prussia and Poland and the other into Romania in the South. The basic idea of Soviet military planning consisted in the fact that the Red Army was to concentrate near the border under the disguise of maneuvers and to go over into a sudden, decisive attack. "The absence of any references to the possible defensive operations of the Red Army shows that the discussion was not about the preparation for a pre-emptive strike but for the assault on Germany and its allies. This idea is clearly expressed in the document of May 15, 1941, by which the Red Army was to be guided in the beginning of war." Meltyukhov suggests that the assault on Germany was initially planned to take place on June 12, 1941, but was postponed because the Soviet leadership feared an Anglo-German reconciliation against the Soviet Union after the flight of Rudolf Hess on May 12, 1941. The basis for this assumption is revealed by Molotov's recollection 40 years later in a conversation with Russian journalist Ivan Stadnyuk: "I don't remember all the motives for cancelling this decision, but it seems to me that Hitler's deputy Rudolf Hess' flight to England played the main role there. The NKVD reconnaissance reported to us, that Hess on behalf of Hitler had proposed the United Kingdom to conclude peace and to participate in the military march against the USSR... If we at this time would have unleashed ourselves a war against Germany, would have moved forces to Europe, then England could have entered the alliance with Germany without any delay... And not only England. We could have been face to face with the entire capitalist world". Meltyukhov believes that "the question about the new period of the completion of war build-up was solved on May 24, 1941, at the secret conference of military-political leadership at the Kremlin. Now accessible sources show that the full concentration and the development of the Red Army on Soviet Western districts was to be completed by July 15, 1941. The rate of the concentration of the Red Army on the Western borders was increased. Together with the transfer of 77 divisions of the second strategic echelon, from June 12 to June 16, 1941, began the re-dislocation of troops of the second echelon of armies and reserves of the military districts near the Western boundary. As for German offensive plans, Meltyukhov points out that the German leadership hoped for a rapid crushing defeat of the USSR which would have given Germany necessary resources for victory in a long war with England, and maybe the United States. Hitler's idea could thus be characterised as striving for a victory in the East for the purpose of winning the war against the West. Therefore, Meltyukhov claims, the explanations by Nazi leaders of a pre-emptive strike against the Soviet Union were groundless, since Hitler had regarded the concentration of Soviet troops as merely defensive. Operation Barbarossa was scheduled a long time before, and Hitler hadn't really comprehended the Soviet invasion threat. The concentration of Soviet troops was interpreted as a defensive reaction to the discovered Wehrmacht deployment. With regards to the failure of the Soviet leadership to comprehend the German threat, Stalin hadn’t believed Hitler was going to invade and risk war on two fronts. What is more, it is believed that Stalin was expecting a German ultimatum and thus the Soviets evaluated the concentration of troops as a means of pressure. It is important to point out, however, that this table ignores powerful German forces positioned north of Ostroleka, who could have interfered with the Soviet plan. These included the whole of Army Group North with the Sixteenth Army, the Eighteenth Army, and Fourth Panzer Army, as well as Army Group Centre's Ninth Army and the Third Panzer Army to the North of Lomzha. According to estimations by B. Sokolov, on the basis of Georgy Zhukov's proposal from May 15, 1941, 152 Soviet divisions had to break 100 German divisions as the main attack was provided for the South-Western Front in the direction of Kraków, Katowice. Meltyukhov believes that the Western leaders would have approved the Soviet strike, for it was difficult for the United Kingdom to win the war alone and the British had already done everything within their means to convince the Soviets to take a less benevolent attitude towards Germany. Due to the remarkable thoroughness and important subject matter the work received many reviews in Western academic publications and was referred to in several other World War II studies. Meltyukhov's study — namely the chapter dealing with the Soviet military's takeover of the Baltic states — has been used by Estonian historian Magnus Ilmjärv for specifics on Soviet military planning against the three republics and determining the number of Soviet forces allocated. Meltyukhov's book (which has been translated into Estonian as Stalini käestlastud võimalus) has also been reviewed quite positively by Estonian historians. Russian émigré historian Constantine Pleshakov, also supportive of the planned Soviet offensive theory, has used Stalin's Missed Chance (just like books by V. Nevezhin and V. Danilov) in his recent study. Meltyukhov's book, as well as other similar titles, has been reviewed by professor Raack in the Russian Review. ^ Городецкий Г. Миф "Ледокола": Накануне войны. Пер. с англ. М.,1995. С.284. ^ Новая и новейшая история. 1992. № 6. С.7. ^ Стаднюк И.С. Нечто о сталинизме//О них ходили легенды. М.,1994. С.423—424. ^ Группировка войск сторон взята по: Сборник военно-исторических материалов Великой Отечественной войны. Вып. 18. С.66—68, 79—85; 1941 год. Документы. Кн.2. С.216—219. ^ http://militera.lib.ru/research/sokolov1/02.html; Бобылев П. Н. Репетиция катастрофы // Военно-исторический журнал. 1993. №№ 6, 7, 8. ^ Mihhail Meltjuhhov Stalini käestlastud võimalus : Nõukogude Liit ja võitlus Euroopa pärast 1939-1941 (dokumendid, faktid, arvamused) Tartu, 2005. ISBN 978-9949-435-03-6. Richard C. Raack, "Preventive Wars?" [Review Essay of Pietrow-Ennker, Bianka, ed. Präventivkrieg? Der deutsche Angriff auf die Sowjetunion. 3d ed. Frankfurt-am-Main: Fischer Taschenbuch Verlag, 2000. ISBN 3-596-14497-3; Mel'tiukhov, Mikhail. Upushchennyi shans Stalina: Sovetskii Soiuz i bor'ba za Evropu 1939–1941. Moscow: Veche, 2000. ISBN 5-7838-1196-3; Magenheimer, Heinz. Entscheidungskampf 1941: Sowjetische Kriegsvorbereitungen. Aufmarsch. Zusammenstoss. Bielefeld: Osning Verlag, 2000. ISBN 978-3-9806268-1-1] in The Russian Review, 2004, Vol. 63, Issue 1, pp. 134–137. The Continuation War was a conflict fought by Finland and Nazi Germany, as co-belligerents, against the Soviet Union (USSR) from 1941 to 1944, during World War II. In Russian historiography, the war is called the Soviet–Finnish Front of the Great Patriotic War. Germany regarded its operations in the region as part of its overall war efforts on the Eastern Front and provided Finland with critical material support and military assistance. Operation Barbarossa was the code name for the Axis invasion of the Soviet Union, which started on Sunday, 22 June 1941, during World War II. The operation stemmed from Nazi Germany's ideological aims to conquer the western Soviet Union so that it could be repopulated by Germans (Lebensraum), to use Slavs as a slave labour force for the Axis war effort, to murder the rest, and to acquire the oil reserves of the Caucasus and the agricultural resources of Soviet territories. The Workers' and Peasants' Red Army, frequently shortened to Red Army was the army and the air force of the Russian Soviet Federative Socialist Republic, and, after 1922, the Union of Soviet Socialist Republics. The army was established immediately after the 1917 October Revolution. The Bolsheviks raised an army to oppose the military confederations of their adversaries during the Russian Civil War. Beginning in February 1946, the Red Army, along with the Soviet Navy, embodied the main component of the Soviet Armed Forces; taking the official name of "Soviet Army", until its dissolution in December 1991. 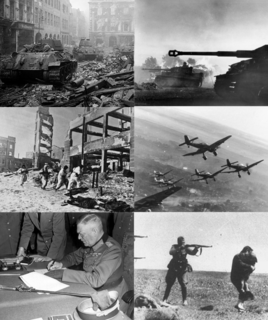 The Eastern Front of World War II was a theatre of conflict between the European Axis powers and co-belligerent Finland against the Soviet Union (U.S.S.R.), Poland and other Allies, which encompassed Central Europe, Eastern Europe, Northeast Europe (Baltics), and Southeast Europe (Balkans) from 22 June 1941 to 9 May 1945. It has been known as the Great Patriotic War in the former Soviet Union and modern Russia, while in Germany it was called the Eastern Front, or the German-Soviet War by outside parties. The Battle of Moscow was a military campaign that consisted of two periods of strategically significant fighting on a 600 km (370 mi) sector of the Eastern Front during World War II. It took place between October 1941 and January 1942. The Soviet defensive effort frustrated Hitler's attack on Moscow, the capital and largest city of the Soviet Union. Moscow was one of the primary military and political objectives for Axis forces in their invasion of the Soviet Union. 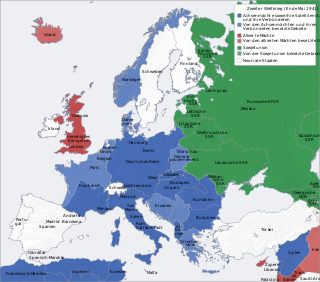 German–Soviet Union relations date to the aftermath of the First World War. The Treaty of Brest-Litovsk, dictated by Germany ended hostilities between Russia and Germany; it was signed on March 3, 1918. A few months later, the German ambassador to Moscow, Wilhelm von Mirbach, was shot dead by Russian Left Socialist-Revolutionaries in an attempt to incite a new war between Russia and Germany. The entire Soviet embassy under Adolph Joffe was deported from Germany on November 6, 1918, for their active support of the German Revolution. Karl Radek also illegally supported communist subversive activities in Weimar Germany in 1919. The Second Battle of Kharkov or Operation Fredericus was an Axis counter-offensive in the region around Kharkov against the Red Army Izium bridgehead offensive conducted 12–28 May 1942, on the Eastern Front during World War II. Its objective was to eliminate the Izium bridgehead over Seversky Donets or the "Barvenkovo bulge" which was one of the Soviet offensive's staging areas. After a winter counter-offensive that drove German troops away from Moscow but depleted the Red Army's reserves, the Kharkov offensive was a new Soviet attempt to expand upon their strategic initiative, although it failed to secure a significant element of surprise. 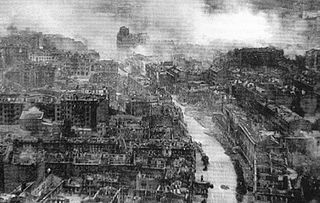 The First Battle of Kiev was the German name for the operation that resulted in a very large encirclement of Soviet troops in the vicinity of Kiev during World War II. This encirclement is considered the largest encirclement in the history of warfare. The operation ran from 7 August to 26 September 1941 as part of Operation Barbarossa, the Axis invasion of the Soviet Union. In Soviet military history, it is referred to as the Kiev Strategic Defensive Operation, with somewhat different dating of 7 July – 26 September 1941. The Bulgarian Resistance was part of the anti-Axis resistance during World War II. It consisted of armed and unarmed actions of resistance groups against the Wehrmacht forces in Bulgaria and the Kingdom of Bulgaria authorities. It was mainly communist and pro-Soviet Union. Participants in the armed resistance were called partizanin and yatak. Ivan Ivanovich Maslennikov, General of the Army, was a Soviet military and NKVD commander of Army and Front level during World War II. A career Red Army officer, Maslennikov was transferred to NKVD system in 1928, and remained there until the German invasion of 1941, progressing from a counter-guerrilla squadron commander to the chief of NKVD troops. After a mixed career in field troops of World War II and three post-war years, Maslennikov returned to NKVD in 1948 and stayed there, despite political changes, until his suicide in 1954. The Soviet Union signed a non-aggression pact with Nazi Germany on 23 August 1939. In addition to stipulations of non-aggression, the treaty included a secret protocol that divided territories of Romania, Poland, Lithuania, Latvia, Estonia, and Finland into German and Soviet "spheres of influence", anticipating potential "territorial and political rearrangements" of these countries. In October and November 1940, German-Soviet talks about the potential of joining the Axis took place in Berlin, nothing came from the talks since Hitler's Ideological goal was Lebensraum in the East. The Soviet offensive plans controversy is the debate among historians about whether Soviet leader Joseph Stalin planned to attack Axis forces in Eastern Europe prior to Operation Barbarossa. The German–Soviet military parade in Brest-Litovsk was an official ceremony held by the troops of Nazi Germany and the Soviet Union on September 22, 1939, during the invasion of Poland in the city of Brest-Litovsk. It marked the withdrawal of German troops to the previously agreed demarcation line and the handover of the city and its fortress to the Soviet Red Army. Operation Pike was the code-name for a strategic bombing plan, overseen by Air Commodore John Slessor, against the Soviet Union by the Anglo-French alliance. British military planning against the Soviet Union occurred during the first two years of the Second World War, when, despite Soviet neutrality, the British and French came to the conclusion that the Nazi–Soviet pact made Moscow the ally of Hitler. The plan was designed to destroy the Soviet oil industry, to cause the collapse of the Soviet economy and deprive Nazi Germany of Soviet resources.